My mom got me hooked on succulents. She had a love of the miniature plants, and now I have developed quite a succulent habit. I use every visit to a nursery as an excuse to add a new plant to my burgeoning collection. What is the difference between cacti and succulents? All cacti are succulents but not all succulents are cacti. Named for the Latin succulentus, meaning juice or sap, succulents are defined by their liquid storage ability and belong to many different botanical families. The cactus plant is defined by small, spherical, pillow-like structures called areoles from which spines, branches, leaves, hairs and even flowers emerge. Many succulents look similar to cactus, but if they do not have these cushiony areoles, then they are not in the cactus family (Cactaceae). Succulents are native to most parts of the world whereas cacti occur naturally only from Alaska to Chile. In Maine, Vermont and New Hampshire, a native cactus has never been found. Surprisingly, Canada boasts several native cacti that have evolved to survive the harsh winters. In Napa Valley's Mediterranean climate, succulents are a good choice for an easily maintained, slower-paced garden. Most require little water. However, low care does not mean no care. Check your succulents regularly to catch and treat stressed plants quickly. An actively growing succulent may need water anywhere from once a week to once a month depending on the type and size of the plant, its location, the container and the weather. The larger the plant and the plumper and fatter the leaves, the less water the plant needs. Keep the soil as moist as a wrung-out sponge. Use a drip system or water by hand, but moisten the soil and not the plant. Water can cause “sunburn” spots on the leaves. If you forget to water, succulents usually adjust; if you over water, no worries. Unless waterlogged, they do fine. When in doubt, don't water. Although they do not do well in full shade, succulents need only three to four hours of sunlight daily. Protect them from the onslaught of the midday sun. Early-morning and late-afternoon sun is best, with filtered exposure at noon. The plants need much less sun in winter, but be sure to protect them from frost. The succulent's plump leaves freeze easily. 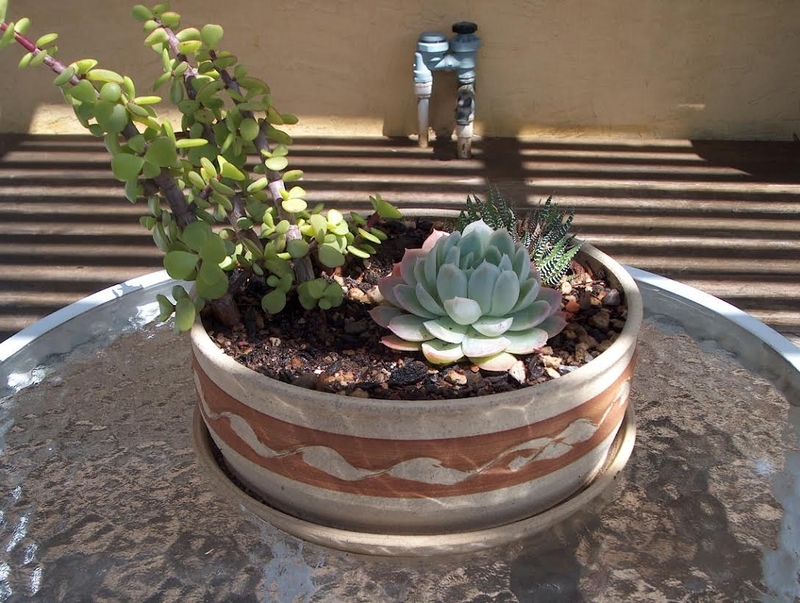 With their shallow root systems, succulents do well in pots or in the ground. Nurseries sell container mixes for cactus, but you can make your own with two parts potting soil to one part perlite and one part coarse sand. Remove the plant from its nursery pot and spread the roots out on top of a small mound of soil. Add more soil but keep the roots shallow; press down softly to anchor the plant. At the time of planting, add one teaspoon of slow-release fertilizer per gallon of soil. In spring, feed plants with a low-nitrogen liquid fertilizer diluted to half strength; be sure to moisten the soil first. Do not over-fertilize or the plant may develop softened foliage that is susceptible to rot. Like all plants, succulents need occasional dividing, deadheading and pruning. They experience a growth spurt when moved to a larger pot. 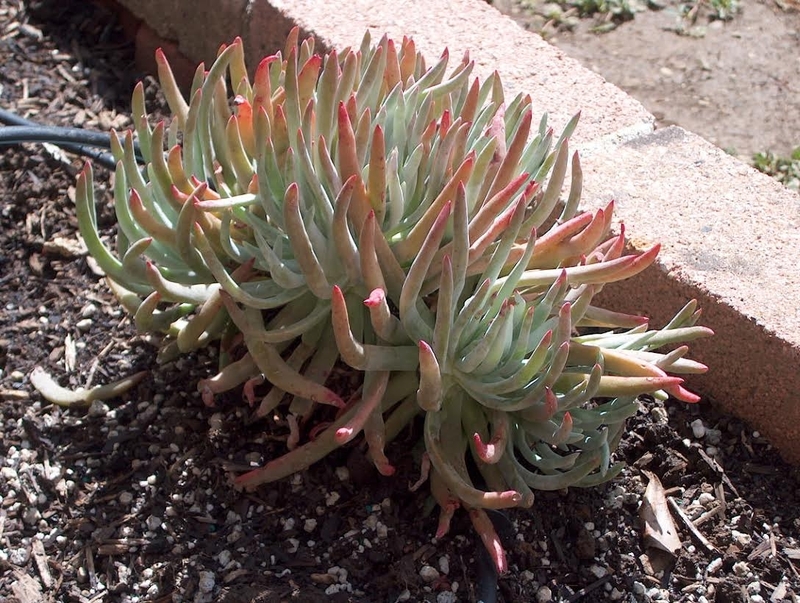 Some succulents are winter growers and look unwell in summer. Resist the impulse to overwater them during this period. For most succulents, early summer is a good time to propagate. Allow new cuttings to dry or “callus” before planting them. Putting them in soil immediately encourages the cuttings to draw too much moisture and possibly rot. Succulents are not plagued by many pests. Aphids, spider mites and mealy bugs are the most common. A judicious squirt of water from a spray bottle or hose removes these invaders easily. A cotton swab soaked in isopropyl alcohol and dabbed directly on the pest will also work. Avoid getting alcohol on the plant as it might damage the leaves. For more information on dealing with the pests that plague succulents, visitwww.ipm.ucdavis.edu. Recently I attended a local flower show, and all the amazing ideas for using succulents really got my creative juices flowing. One display was of miniature fairy gardens complete with rock paths and little houses. My mind immediately started creating a tiny landscape of chubby, scalloped, speckled, spikey, fleshy, prickled succulents. The possibilities are endless and only limited by my imagination. Workshops: U. C. Master Gardeners of Napa County will conduct a workshop on “Succulent Gifts” on Sunday, November 8, from 2 p.m. to 4 p.m., at the Yountville Community Center, 6516 Washington Street, Yountville. Bring your own love of succulents to this workshop dedicated to making gifts for the holidays or for yourself. Master Gardeners will concentrate on the right kind of soil and care for succulents, discuss the myriad succulent types, and help you make a succulent garden or two to give as gifts. Please bring succulent cuttings if you would like to share. Call 707-944-8712 to register or visit the Parks and Recreation web site. “Succulent Gifts” workshop will be repeated on Saturday, November 14, from 9:30 a.m. to 11:30 a.m. at the University of California Cooperative Extension Office, 1710 Soscol Avenue, Napa. Master Gardeners are volunteers who help the University of California reach the gardening public with home gardening information. U. C. Master Gardeners of Napa County ( http://ucanr.org/ucmgnapa/) are available to answer gardening questions in person or by phone, Monday, Wednesday and Friday, 9 a.m. to Noon, at the U. C. Cooperative Extension office, 1710 Soscol Avenue, Suite 4, Napa, 707-253-4143, or from outside City of Napa toll-free at 877-279-3065. Or e-mail your garden questions by following the guidelines on our web site. Click on Napa, then on Have Garden Questions? Find us on Facebook under UC Master Gardeners of Napa County. After four years of dwelling on drought, Napa Valley may have the opportunity to shift gears and address having too much water rather than too little. Clean up your yard.Inspect your landscape for debris, outdoor furniture or other objects that could be tossed by storm winds. Spend an afternoon tidying up the yard and storing or securing furniture and other loose items to prevent a frantic scramble to collect items that have landed on your roof or in your neighbor's yards. Inspect gutters and downspouts. Make sure gutters are clear of leaves and other debris and connections between gutters and downspouts are functioning properly. Faulty gutters and downspouts can also lead to soil erosion adjacent to buildings and serious water and foundation displacement problems in basements and crawl spaces. Make sure downspouts direct water away from buildings and do not create standing water. Storm water runoff from impermeable surfaces (roofs, driveways, patios) should be directed into a collection system to avoid soil saturation. Inspect your roof. Roofs with loose tiles or holes spell trouble. Inspect flashing to ensure water is directed away from seams and joints. Inspect retaining walls. Check retaining wall drains, surface drains, culverts and ditches for obstructions or other signs of malfunction. Do this review before the storm season and after every storm. Inspect slopes. Monitor sloped areas for signs of gullying, surface cracks and slumping. Inspect patios, retaining walls and garden walls for signs of cracking or rotation, which might indicate slope movement. If you notice problems, have the site inspected by a geotechnical engineer. Vanquish bare ground. Make sure your yard and garden does not have bare areas that could initiate mudflows during a storm. Fall is a good time to put down mulch and establish native plants. There may still be time to encourage vegetation in bare areas before the storm season. Review storm drains.Inspect storm drains before the storm season and after every rain. If drains are obstructed, clear the material from the drain or notify the Department of Public Works or the public agency responsible for drain maintenance. Monitor trees.If any trees appear weakened by drought, ask an arborist to inspect them. High winds can fell trees, and their branches can knock out power or seriously damage homes and vehicles. Install swales and French drains. If you have areas that flood, consider installing swales or French drains to move the water to where it can better infiltrate the soil. Swales slow and capture runoff by spreading it horizontally across the landscape. Create a swale by digging a ditch on contour and piling the dirt on the downhill side of the ditch to create a berm. A French drain is a trench filled with gravel or rock containing a perforated pipe that redirects surface water and groundwater away from an area. A French drain can have perforated hollow pipes along the bottom to quickly vent water that seeps down through the upper gravel or rock. French drains are primarily used to prevent ground and surface water from penetrating or damaging building foundations. Consider further steps. If you still have concerns about slope stability, flooding and mudflows after taking these steps, consider stockpiling sandbags and plastic sheeting, straw wattles or straw bales. These items can form a barrier to keep water from flooding low areas. Plastic sheeting can be placed on slopes and secured with sandbags to prevent water from eroding the soil. 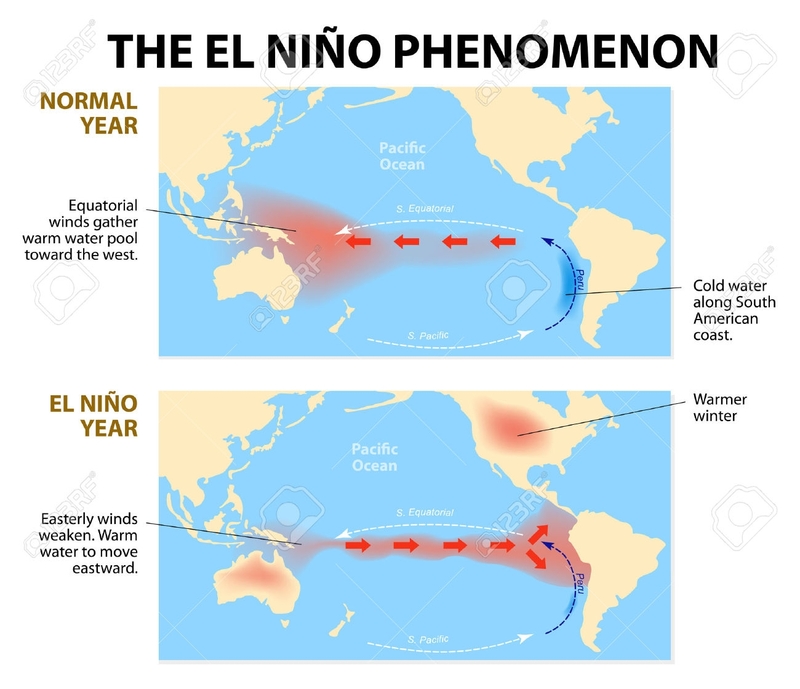 Workshop: U. C. Master Gardeners of Napa County will host a workshop on El Niño on Saturday, October 31, from 9:30 a.m. to 11:30 a.m., at the University of California Cooperative Extension Office (address below). 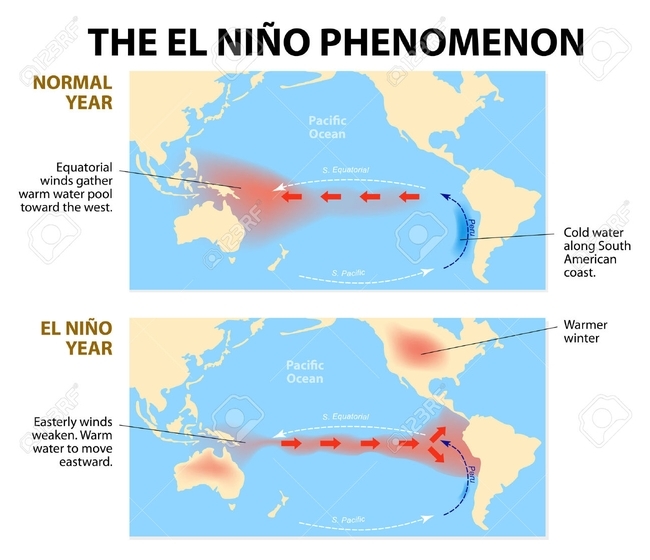 An El Niño winter is on the horizon, no doubt about it. Napa County could well see heavier than average rainfall. This workshop will focus on measures to take now to prepare your home and garden for heavy rain. You will also learn steps to take during and after a flood. Online registration (credit card only) Mail-in registration (cash or check only). Fall is here, days are getting shorter, and we have already had a little rain. With so many flowering plants at their peak, we may need a reminder that the time to plant bulbs, set out annuals for winter color and sow seeds for spring bloom is now. As you clean up your garden and remove summer annuals, take care to banish weeds and their seedpods, too. Pick up a truckload of well-aged compost, or schedule a delivery, from one of Napa County's two excellent compost companies. Nourish tired garden soil with fertilizers that replace potassium and phosphorous. After you fertilize and amend soil, water well to disperse the nutrients. If your fertilizer comes in a bag, box or bottle, carefully follow abel directions. Be merciless in removing weed seedpods. However, if you grew calendulas, violas, forget-me-nots or zinnias, shaking their seed heads as you weed will reward you with color spots the following spring. Even some edible crops like lettuce, onions and parsley will often reseed if you encourage them. In fact, some annuals are such vigorous self-sowers thatWeeds of California and Other Western States,a University of California publication, considers them weeds. Violets, forget-me-nots and many others are in this group. Luckily for me, they are some of my favorite flowers. Denim-blue or yellow violas, sweet-scented purple violets (Viola odorata) and bold-faced pansies ranging from deep blue to pink can all be planted now. Plant violas in garden beds and put more in pots to bring some cheer to the coming winter days. 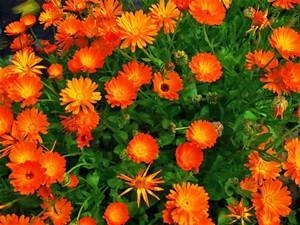 Tuck calendulas, also called pot marigolds, in any bare spot in the garden, and they will reward you with bright gold flowers throughout the winter. They will fade in summer's heat, but then a shake of their tough little seed heads will sow the next season's color. In the kitchen, calendula petals can brighten salads and are sometimes used as a “poor man's saffron.”The golden petals can tint rice dishes and other recipes needing a dash of color. Plant perennials and California natives now so they can benefit from still-warm soil and grow strong before winter comes. If you plant foxglove seedlings from six-packs now, they will be six feet tall and have towering blossoms by next year. Small snapdragon plants, which children will enjoy, will be covered with little snappers by summer and provide bright flowers through the winter months, too. Even decorative vegetables can perk up a walkway or bed. Pink and lime-green cabbages and vivid purple and red kales can provide color all winter long. Sow seed now for the golden California poppies and red poppies that grace many an Impressionist canvas. It's a good time to sow other wildflowers, too, before the rains come. Look for seed packets of your favorites, or pick up one of the many wildflower blends formulated for shady or sunny spots. Bulbs, corms and tubers are on nursery shelves now. Plant daffodils, sparaxis and freesia in garden beds or pots to brighten decks and indoor rooms. Some bulbs do benefit from pre-chilling, so read directions that come with the bulbs. Make sure beds and pots have good drainage. Although many people are removing lawns, October is a good month to plant new lawn or renovate an older one. Over-seed now to correct bare or stressed spots. Napa County Cooperative Extension recommends a premium blend of grass formulated for California's cooler growing areas. If you are curious about which turf grass is best, you can get reports from Cooperative Extension on how the different grasses and blends perform. Lawns and turf are often criticized as being wasteful of water, but they do provide some fire protection around a home. Sweet peas can be planted now. Dig beds deeply and amend with aged compost.Tall varieties can be grown along fences or trellises and short varieties in beds or containers. Heirlooms with rich fragrances are my favorites, but last year I planted a dwarf sky-blue variety that bloomed tirelessly in a half barrel on the deck until the first summer heat finished them. October weather can be varied, so be vigilant a little longer. Pay attention to weather forecasts and protect your new seed sprouts and tender seedlings from any final scorching days. Windy days zap moisture from air and soil, so make sure young plants are weathering those conditions, too. Workshop: U. C. Master Gardeners of Napa County will host a workshop on “Citrus” on Saturday, October 24, from 9:30 a.m. to 11:30 a.m., at the University of California Cooperative Extension Office, 1710 Soscol Avenue, Napa. This workshop will focus exclusively on caring for citrus, large and small. Potting and repotting container citrus, pruning, watering and fertilizing, frost protection and recovery from frost damage are part of the program. The workshop will also cover using the University of California IPM website to identify and understand citrus disease and pests.Online registration (credit card only); Mail-in registration (cash or check only). There are more than 20 native species of oak trees in California. The mighty oak tree is an essential and handsome component of the Napa Valley. Nine native species plus many hybrids of these species have thrived in our landscape for centuries. Oak trees typically grow in woodlands, in conditions ranging from shallow soils with little moisture to the deep, fertile soils of the alluvial valley floors. These trees are as diverse in appearance as the conditions they grow in, ranging from 15 to150 feet tall. They differ in shape, color, leaf texture and type of acorns, and whether they are deciduous, evergreen to semi-evergreen. If you are preparing to plant an oak tree (or an acorn), you need to know the soil type, sun exposure and available water at the potential planting site. The valley oak (Quercuslobata) flourishes in the deep, fertile, well-drained soil typical of floodplains and valley floors. The scrub oak (Q. berberidifolia), black oak (Q. kelloggii) and coast live oak (Q. agrifolia) all thrive in Mediterranean-type climates characterized by mild, wet winters and hot, dry summers. These species want no summer water. If you are looking to plant an oak tree in a dry habitat, on shallow, rocky, infertile soil, your best choices would be blue oak(Q. douglasii), canyon live oak (Q. chrysolepis), Oregon oak (Q. garryana), interior oak (Q. wislizenii), or the humble leather oak (Q. durata). There are many reasons to keep an existing oak tree.They increase your property value, prevent soil erosion, provide shade and shelter for wildlife and are beautiful to boot. 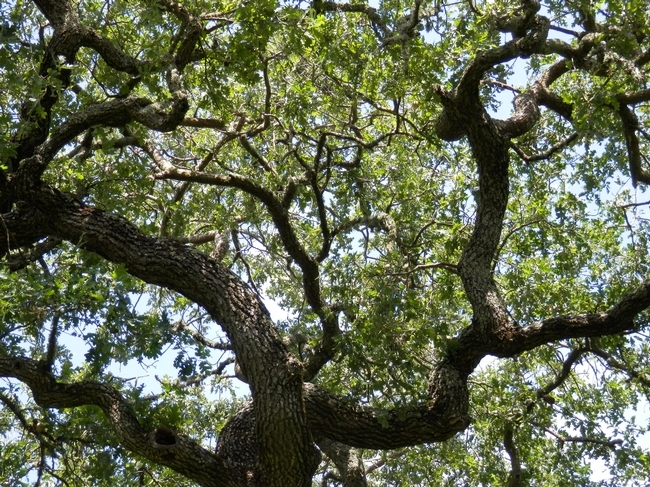 To keep an oak tree healthy, take care to protect the sensitive root system. Roots can extend beyond the tree's drip line by at least one-third of that distance. Do not dig, grade, trench, compact, asphalt, concrete or pave around your oak tree. These activities may fatally damage the root, trunk or crown. Changing the grade, trenching, mounding or creating a swale may also lead to changing the natural drainage. If a mature oak gets more water than it is accustomed to, it will decline. Keep thirsty plants and plantings out of the root zone. Irrigation from agriculture plays a big role in the decline of the valley oak. Choose compatible plants to site under and around your oak. The only fertilizer an established oak needs is its own organic leaf litter for mulch. Keep leaf litter in place, just not up against the trunk. Mulching conserves water, helps moderate ground temperature, improves soil structure and increases organic matter. If you must prune an oak tree, follow the Tree Care Industry Association guidelines, which you can find online. Pruning improperly can lead to wounds that attract insects and promote decay. Poor pruning may also stimulate rapid shoot growth that increases the potential for powdery mildew. It will also compromise the natural beauty of the tree and may make the tree structurally unstable. For the best results, consult a local arborist. Many organisms have symbiotic relationships with the oak tree. Lichens flourish on oak trees where there is sufficient moisture, taking nothing from the oak. Many creatures find the acorns a carbohydrate-rich and fatty addition to their diet. Acorns are appreciated by deer, squirrels, woodpeckers, livestock and boar. Oak trees also shelter many nesting birds, arboreal salamanders, invertebrates and insects. The most complicated relationship the oak tree has is with mycorrhizal fungi. These fungi live in and on the roots and extend way beyond the root system. The oak provides carbohydrates (food) for the fungi and brings up deep water that the fungi can't access. In return, the fungi break down minerals and nutrients and make them available to the oak. In addition, they produce chemicals that inhibit bacteria, thus protecting the tree from disease. With some attention, we humans can also be among the organisms that live symbiotically with the oak tree. Fall garden clean up and pruning has inspired me to make wreaths from my collected garden trimmings. You can make wreaths from all kinds of garden material, both fresh and dried. 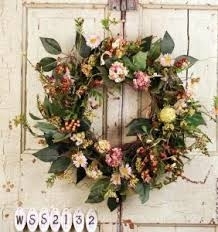 Wreaths are a creative and fun way to decorate your home using gleanings from your garden that you might otherwise discard. You can make a wreath with plant material only or add a little color with ribbon or small decorative items like bells or ornaments. For the base of the wreath, you can purchase a frame or make your own. I have used prunings from my climbing roses, but other vines can work as well, such as grapevine canes. Thin, flexible stems are easier to bend into a wreath than rigid canes. Small flexible tree branches can also serve as the base of your wreath. Choose plants with sturdy or stiff leaves that will look nice for a long time and not wilt. Many conifers are a good choice but test them first. Some, like spruce, will drop their leaves. Other plants that work well are willow, olive, eucalyptus, nandina, euonymus and bay laurel (Laurusnobilis). If you plan to give your wreath away or suspect the wreath may leave the Bay Area, don't use camellias, oaks or California bay laurel (Umbellulariacalifornica).These plants can spread the disease known as sudden oak death, and their movement is restricted. Napa County, other Bay Area counties and coastal counties from Humboldt to Monterey are infested with this disease. Plant material from any infested county should not be moved to a non-infested county. For more information and maps of infested counties, consult www.suddenaokdeath.org. Once you have collected your greens, soak them in water for 30 minutes, then let dry. This bath will keep the greens fresh longer and remove dirt and insects. To make your base, weave the longer branches into a circle. Use green floral wire to keep the ends together or use a commercial wire frame. If using a wire frame, cut your greens into four- to six-inch pieces. Gather small bunches of greens, like a small bouquet, and attach them to the frame with green floral wire. Use each new bunch to cover the stems of the last, working around the frame until it is covered. Cover the last set of stems with an accent piece or bow. Once you have finished the base, add accent pieces. These can be tucked into the greens, wired on or glued on. The best method depends on the item and how heavy or fragile it is. Grass flower heads or little bunches of dried herbs can be wired together, then tucked or wired into the greens. Cones or slightly heavier items are best attached with wire. To attach acorns, dried flowers, small bows or other small ornaments, use a hot glue gun. Some items can be tricky to attach but are worth a try. Add sparkle with spray-on “snow” or glitter. Scout your garden for plants that have interesting textures or colors that will brighten your wreath. Consider fresh or dried flowers and herbs, small dried vegetables such as red chilies, seed pods, cones, sturdy berries, colored twigs or stems. I have even used a small bird nest that I found while cutting back an overgrown shrub. From my garden this year, I will be using dried hydrangeas, grasses, lavender and marjoram as well as dried sage, rose hips and lots of acorns. For most acorns, the caps need to be glued on or they will fall off. To hang, identify the spot on your wreath that you want at top center. That's the 12 o'clock position. Turn the wreath over and locate what would be 10 o'clock and 2 o'clock on a clock face. Attach the two ends of a strong wire or ribbon to the main frame in those spots. The wire or ribbon must be long enough to reach 12 o'clock, the hang spot, when attached. Make sure the wire or ribbon is strong enough to support your wreath and strongly attached to the main frame. Workshop: Napa County Master Gardeners will conduct a workshop on “Creating Wreaths from Your Garden” on Sunday, December 7, from 2 p.m. to 4 p.m., at the Yountville Community Center, 6516 Washington Street, Yountville. Learn which plants from your garden make good wreaths. Learn how to choose and prepare plant materials, and tips and tricks for designing and making easy wreaths for the holidays and beyond. Using materials and supplies provided, participants will create their own wreath to take home. To register, call the Parks & Recreation Department at 707-944-8712 or visit its website. Master Gardeners are volunteers who help the University of California reach the gardening public with home gardening information. Napa County Master Gardeners ( http://ucanr.org/ucmgnapa/) are available to answer gardening questions in person or by phone, Monday, Wednesday and Friday, 9 a.m. to Noon, at the U. C. Cooperative Extension office, 1710 Soscol Avenue, Suite 4, Napa, 707-253-4143, or from outside City of Napa toll-free at 877-279-3065. Or e-mail your garden questions by following the guidelines on our web site. Click on Napa, then on Have Garden Questions? Find us on Facebook under UC Master Gardeners of Napa County.